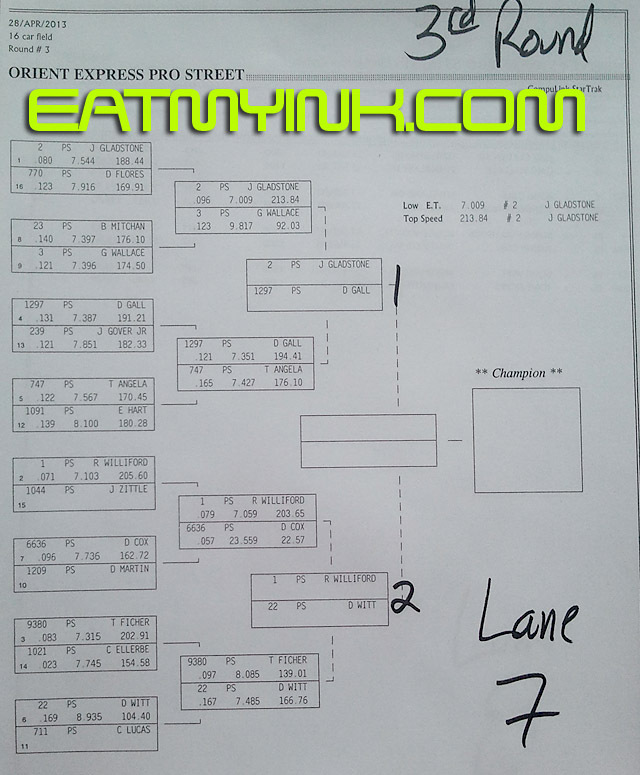 There’s nothing a racer loves better than to double—winning two classes at one event. 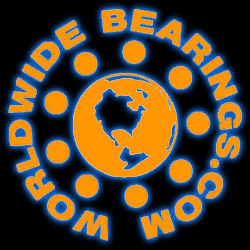 And in the veteran-laden fields of the Mickey Thompson MIRock Superbike Series, doubling is double hard and double rewarding. 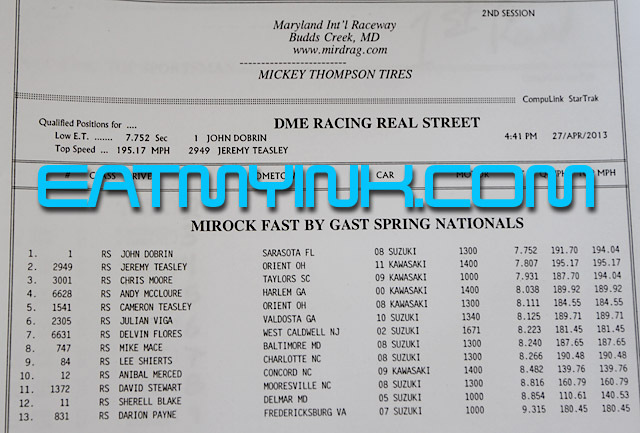 And so it is fitting that two racers doubled at the Fast By Gast Spring Nationals at Maryland International Raceway in Budd’s Creek, MD on April 26-28. 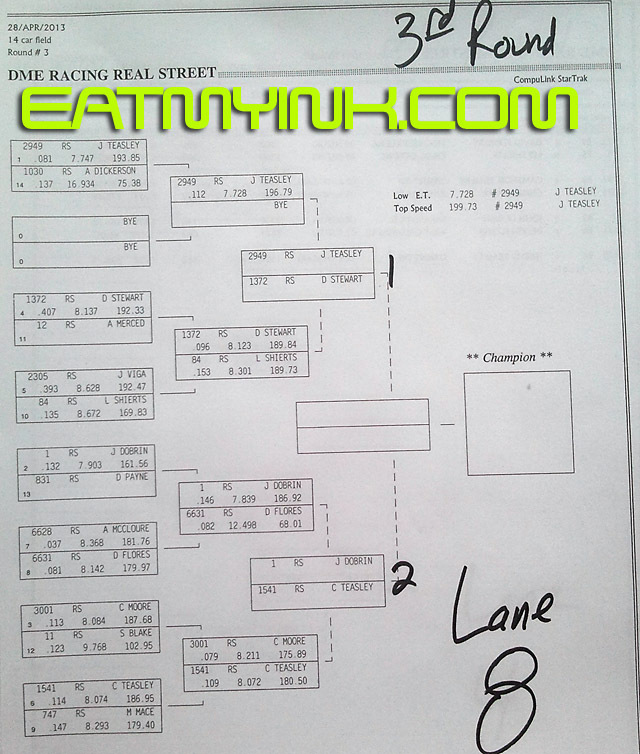 Jeremy Teasley used to rule the DME Real Street class, winning championships seemingly with ease. 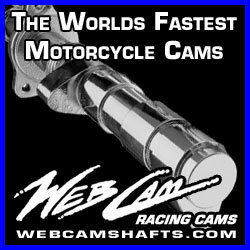 But last year was an inconsistent one for Teasley and his nitrous-huffing, RS Motorsports Kawasaki ZX14, perhaps due to bike owner/builder/tuner Roger Starrette’s constant improvement program. Set a record this event? Let’s change everything and try to go quicker at the next one! 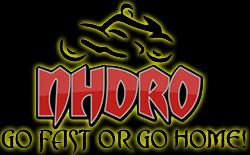 So in stepped Johnny “Turbo” Dobrin, who dominated 2012 with his smooth Exoticycle turbo Suzuki Hayabusa and won the championship. 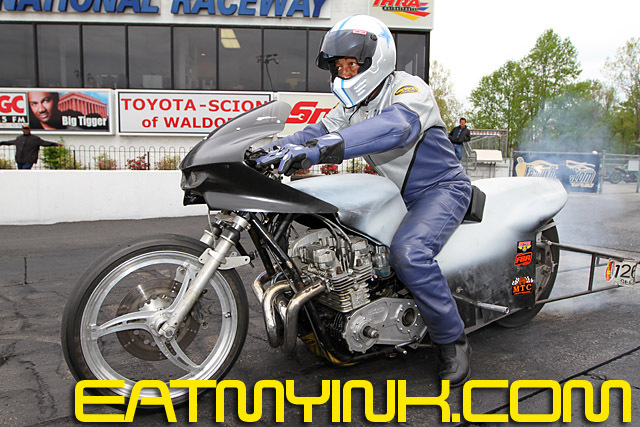 With only one week between the rain-delayed MIRock season opener at Rockingham Dragway and the MIR event, busy businessman Starrette had little opportunity to alter the bike that set a new ET record at The Rock. 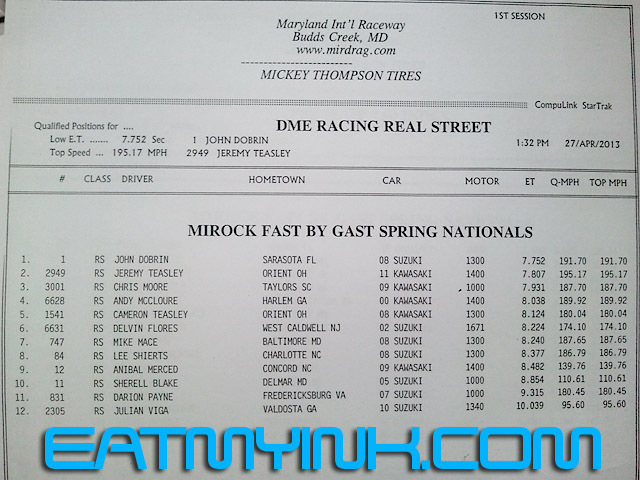 And at MIR, the ’14 seemed destined for a MPH record, nearly hitting 200 with a 199.73 in qualifying. Dobrin is responding, dialing in even more power to his ‘Busa. But you can see the bike leaning, the chassis torqued and twisting as Dobrin tries to chase down the quicker-off-the-line nitrous bike. 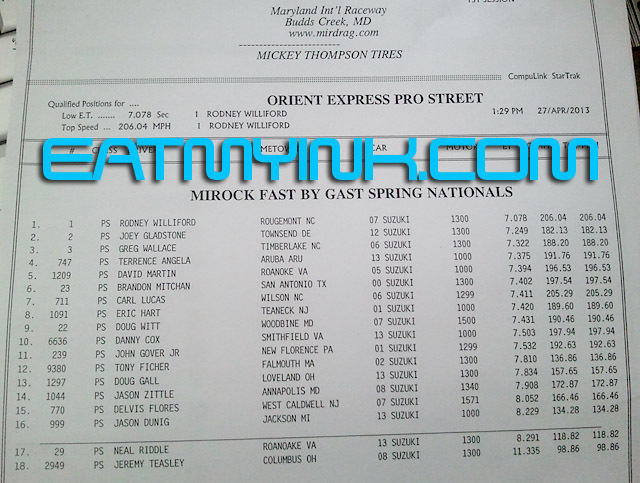 And in the MIR final, Dobrin’s ‘Busa wheelied in the first 60 feet as Teasley streaked away to his second win in two races. Winning two races in a row is sweet, but winning two at one is sweeter. 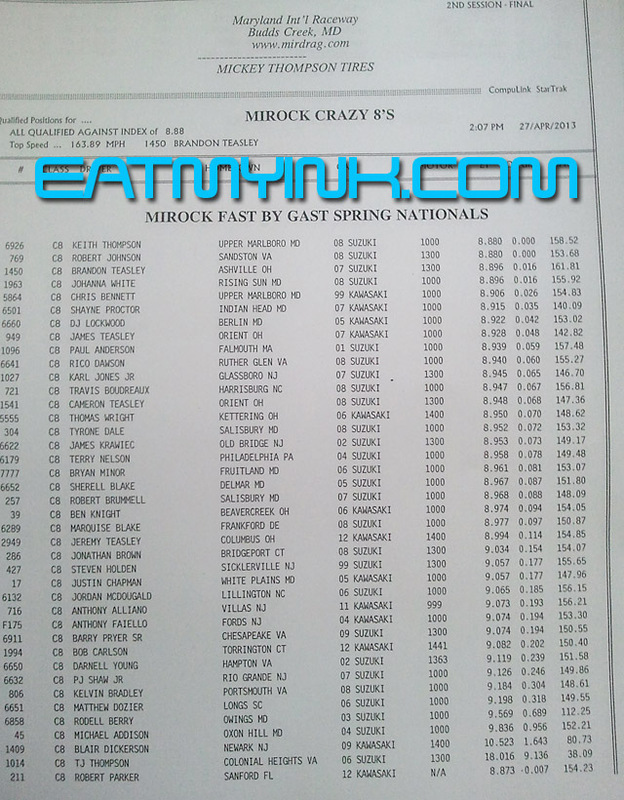 With four members of the Teasley family entered in the 46 bike Crazy 8’s field, there was a decent chance that one of them would win. There was Jeremy’s younger brother Cameron, who won his first ever race last week on the CarrCraft Racing Hayabusa. 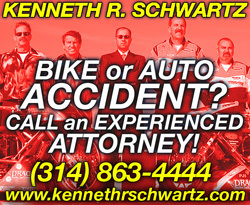 Returning to action was older brother Brandon, the former AMA/Prostar bracket racing dominator. Even dad James Jr, AKA Crow, was in the field at MIR. 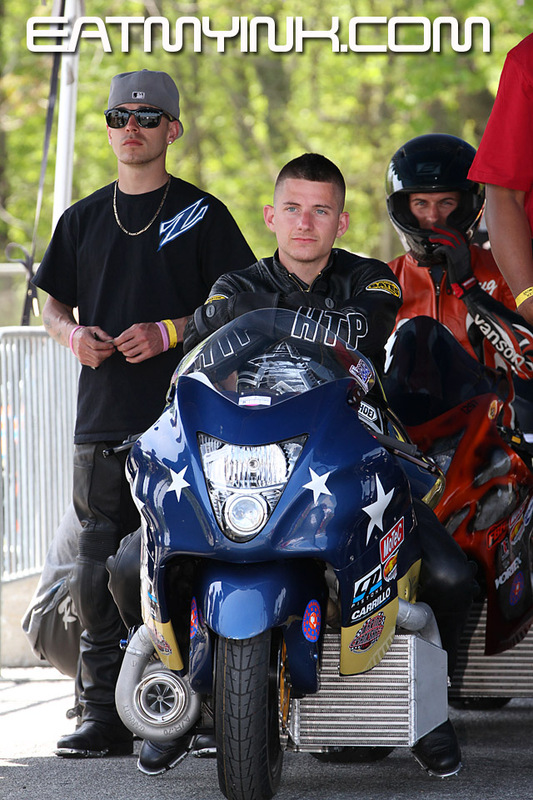 But when the class boiled down to the final it was Jeremy facing a youthful member of another motorcycle drag racing family—Jordan “By the Fire” McDougald. And McDougald was ON fire, taking the tree with an .016 bulb. When it came to running the number, Teasley’s stock wheelbase, stock motor ’14 was more up to the task and he took his second win of the day. While Teasley’s Sunday was doubly delicious, veteran sportsman racer Jimmy Shifflett spread his winning delight over both days of the weekend. 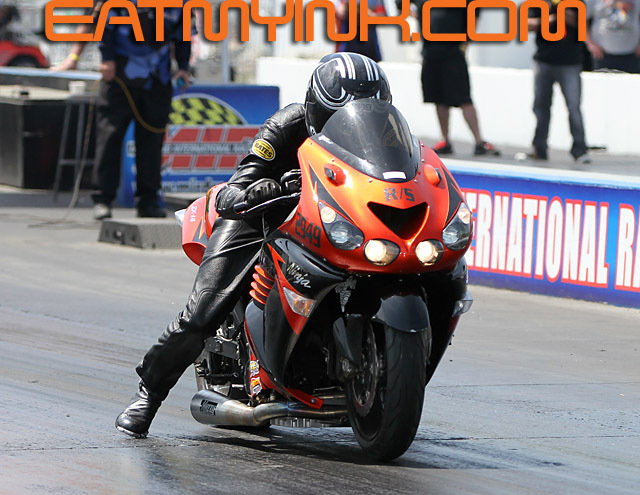 The 2011 5.60 champion beat Rockingham runner-up Alan “Strawberry” Fields in Saturday’s Fast by Gast Pro ET all-wheelie-bar final, then knocked Robert “Crossroads” Johnson’s streetbike out of tune in Sunday’s final. 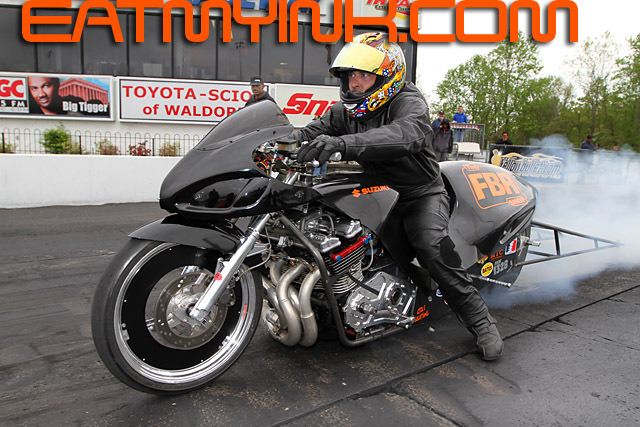 FBR Shop 5.60 went to Willie “Cowboy” Jones on his dragbike over Rockingham ET winner Michael Herman Jr. and his ‘Busa streetbike. 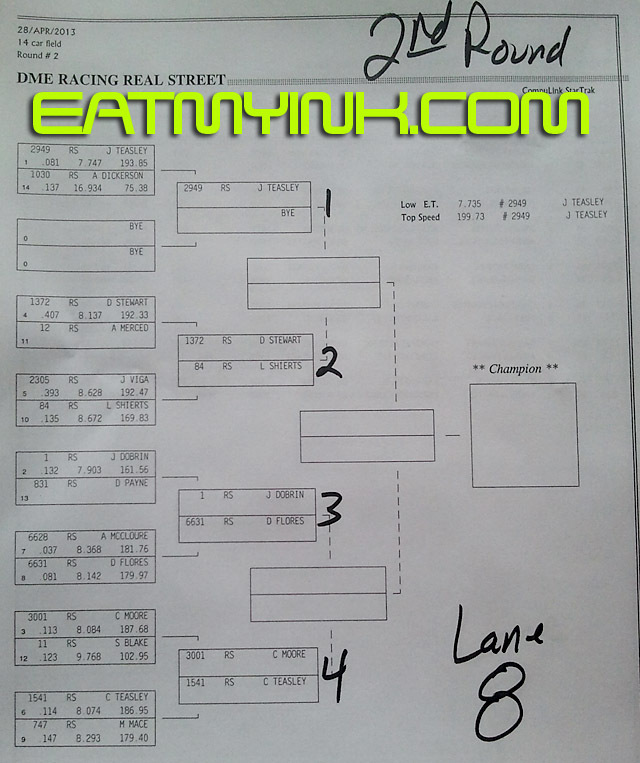 The Louis Concrete 4.60 final was won by Ronnie Smith over Doug Robinson. 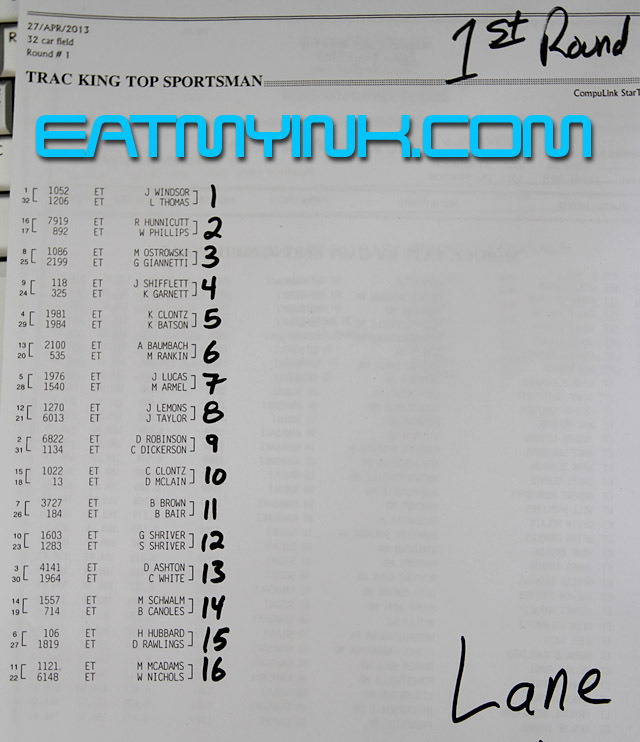 When rain interrupted Sunday’s eliminations, the Trac King/APE Top Sportsman semifinalists opted to split the purse and split for home. But not so the Brock’s Performance Street ET racers. 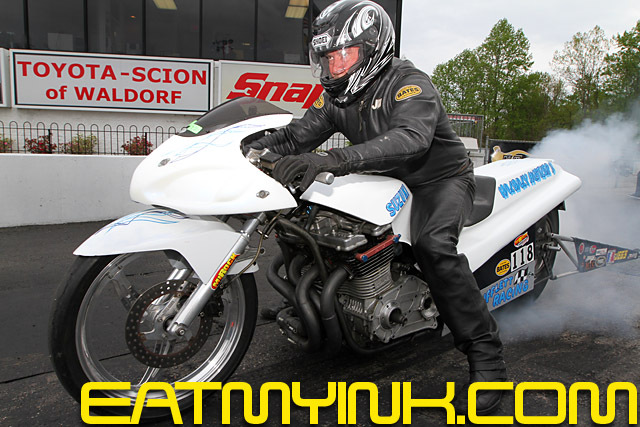 Connecticut’s Bob Carlson wasn’t about to split for home without his full winnings, which he took over Ben Knight in Sunday’s final. Local hero Shayne Proctor won over Mike Schulz on Saturday. 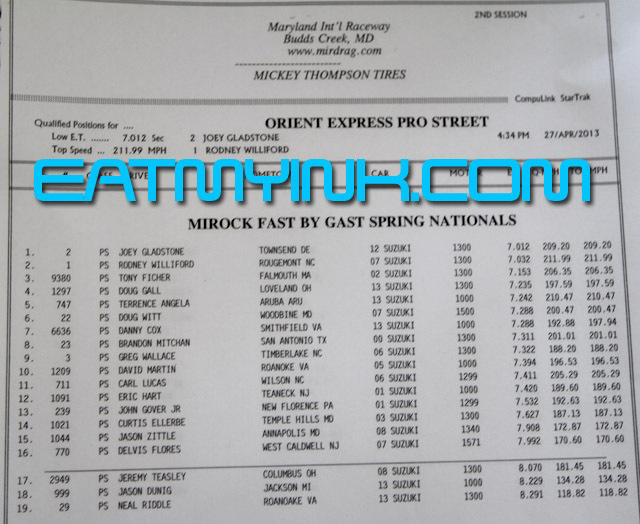 Which leaves us with MIRock’s marquee class— Orient Express Pro Street. 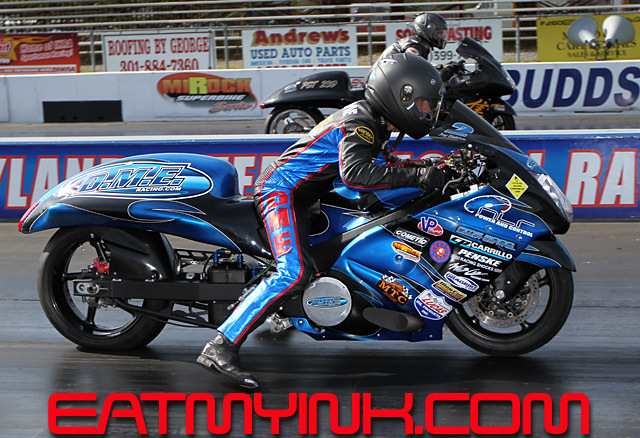 Three-time champ Rodney Williford and DME Racing’s Joey Gladstone traded high MPH punches in qualifying, with Gladstone coming out quickest with a 7.01. 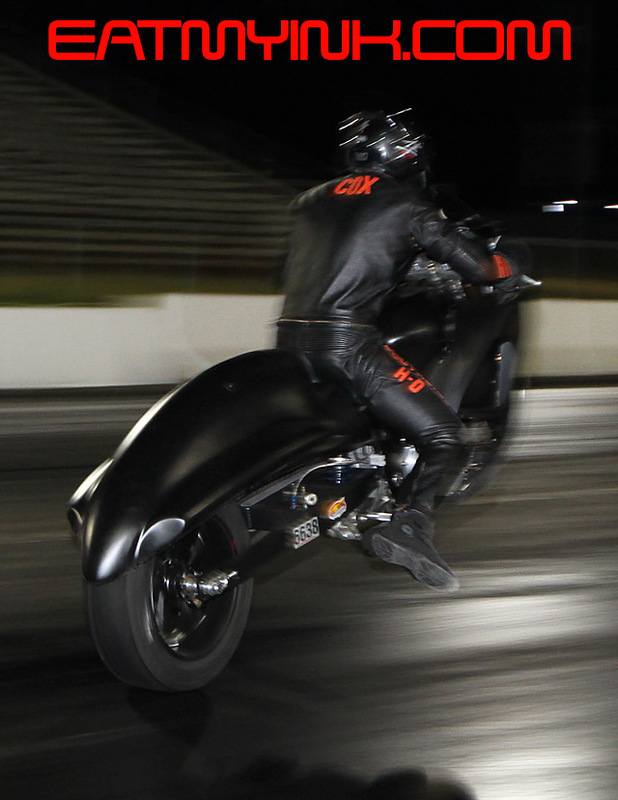 In eliminations, Gladstone eclipsed the record he set just last week with a 213.87 mph blast down the MIR pike. It all boiled down to these two in the final. Williford launched some 2/10ths quicker than Gladstone, but you could hear Rodney pedaling the throttle on the big end. Not so Gladstone and his beautifully set-up DME Hayabusa. He kept the throttle pinned and took the final, capping a great comeback for Joey and the DME team following a high speed crash here in testing earlier this year. 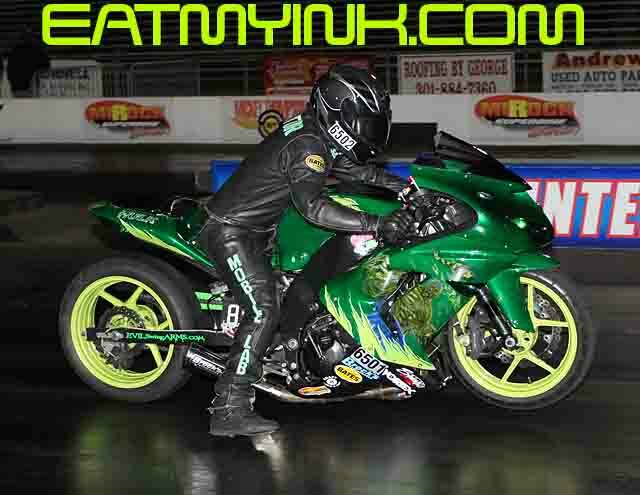 Jason Dunigan won Pro Street B.
Saturday night’s Afterdark Undergound featured many great runs on MIR’s super-sticky surface by Eddie Kane and others, along with some monster wheelies by Danny Cox on the HTP Performance Hayabusa. 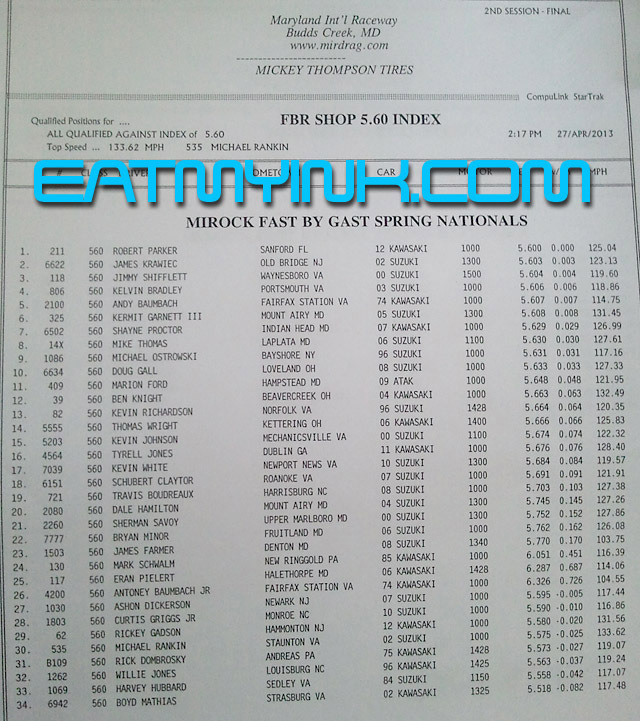 The stars of the Mickey Thompson MIRock Superbike Series return to action at MIR on May 31-June 2 for the Fast by Gast Summer Nationals. 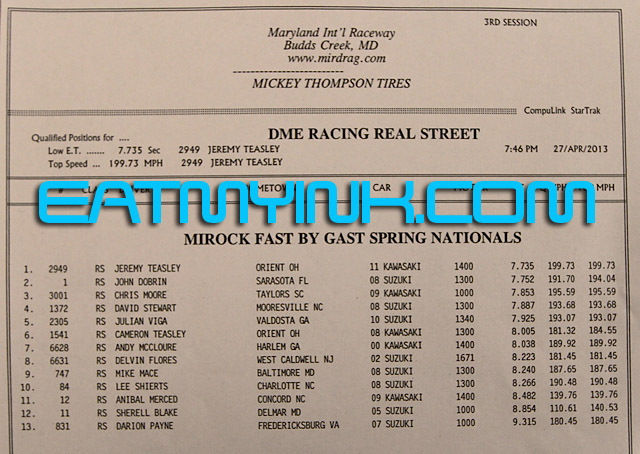 DME’s Joey Gladstone pipped rival Rodney Williford for the Pro Street pole.